Another successful adventure occurred on the rocks near Cosumnes River Gorge. 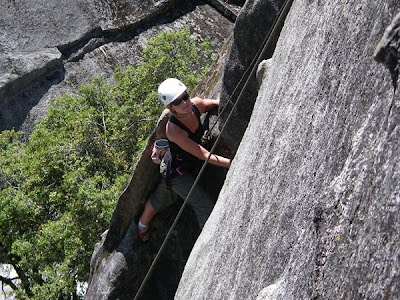 Four of the staff from Peak Adventures guided seventeen participants through the gorge and up rocks. Students, couples, friends, and families including an eleven-year-old girl grasped a feeling of accomplishment during their ascent. The trip began at Sacramento State with a fun-filled activity allowing everyone to feel more connected and comfortable with each other. Then, after arriving at our destination, as one person attempted to reach their climbing goal, the others supported that individual with encouraging words and helpful climbing suggestions. 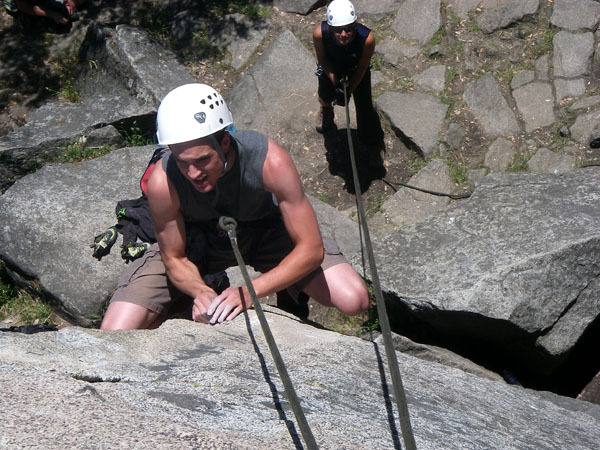 As the day progressed on, participants used their belaying techniques, learned on the pre-trip, to insure the safety of their climbing partner as the climber ascended the rock. Also present in this day of climbing was laughter with old and new friends. The gorge with shady trees, carved rocks, and a nearby running river created a peaceful atmosphere in which one could relax and feel free to be themselves. One could feel the sun’s hot rays but fortunately the temperature dropped once one entered the climb called the chimney. Courage was found for many in the chimney. While belaying climbers in the chimney one could observe climber’s using feet and back to inch up the two walls of the chimney. Then, seeing at least three participants ascend the chimney a second time and reach their goal of the first ledge sparked a moment of celebration. Overall, the combination of a beautiful environment, knowledgeable guides, and friendly participants created a memorable adventure at Cosumnes River Gorge.